After eight and a half months in custody, John faced real and perceived barriers when trying to get in to work – a common situation for people with convictions. 46- 69% of prisoners reoffend on release, at a cost of £7-10 billion a year, yet we know that people are less likely to commit further crimes if they have the dignity, responsibilities, stability and wage that a good job provides. Luckily for John, he was referred to Catch22 by Newham Probation Services two weeks after his release in June 2017. We put supportive people around him, helped him to get the skills he needed to get to a place where he was able to get a job and realise his potential. Recruitment processes don’t just put up barriers for people like John but for a huge proportion of the population. Barriers could include being long-term unemployed, a young or single parent, a carer, having health problems, long term unemployment, a lack of work experience, qualifications or low confidence. This means that your company isn’t able to reach people with incredibly valuable skills and talent, and those individuals are unable to access the jobs and opportunities to effectively start their career. This represents a huge pool of untapped talent, and individuals that bring employers not just access to skills but fresh thinking and new ideas that accompanies diversity. We bridge the gap between an employers’ recruitment needs and individuals that have faced barriers into work. Our Barclays Connect with Work partnership is a fully-funded programme that provides employers and employees with supported entry into a job or apprenticeship. We support employers and candidates to develop early career pathways and grow talent, through apprenticeships or jobs. We’ll deliver a wrap-around programme, offering expert advice to enable you to create business benefits and deliver social change. We also work closely with each employed person to deliver any of the necessary preparatory work so that we can provide a hand-picked and work-ready candidate. We offer in-work support for 6-12 months, as and when required for the individual and business. 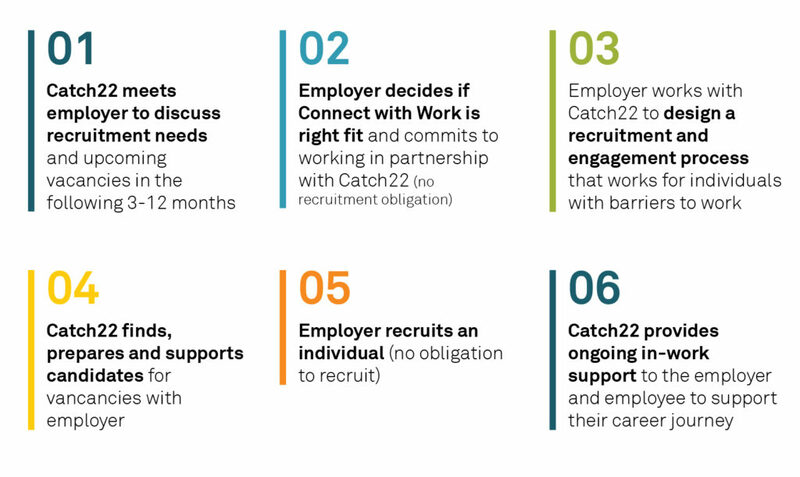 Programmes like Connect with Work can help businesses raise their own productivity by developing their current workforce and investing in their long-term talent pipeline. It is a cost effective way to build a more skilled workforce, fill current and future skills gaps and importantly, to show your workforce that you’re invested in their local community and their development.